Every autumn, the Golden Gate has more hawks, kites, eagles, falcons, vultures, ospreys, and harriers overhead than can be seen anywhere else in the Pacific States. GGRO volunteers have worked for more than three decades to track the populations of these birds of prey during fall migration. We are now recruiting new hawkwatchers and banders for the 2018 fall migration season! Attend one of our recruitment meetings to get an overview of the GGRO and what being a hawkwatcher or bander entails, talk to a current volunteer, and meet with the staff. You will also have the opportunity to pick up an application packet. These meetings are the best way to decide if working with us is right for you! If you cannot attend any of the three meetings, you may request a volunteer application packet via email to ggro@parksconservancy.org. 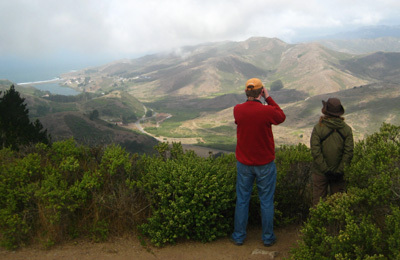 Volunteers must be able to commit to one regular field day in the Marin Headlands every two weeks from mid-August through early December. All training is provided and occurs in July and early August. Hawkwatchers must either be 18 years of age OR have an adult guardian volunteering with them; banders must be 18.There is a mandatory training for new banders all day on Saturday, July 28. All three meetings are identical and you only need to attend one. These recruitment meetings will be held at the GGRO office, Building 1064, Fort Cronkhite, located in the Marin Headlands (just north of the Golden Gate Bridge). If using a smart phone navigation app or GPS device, we recommend using "Rodeo Beach Parking Lot" as the destination. Our office is in the middle row of buildings, two down from the parking lot. For more information, email ggro@parksconservancy.org, or to speak with a staff person you can call the office at (415) 426-5290 between 9 am-4 pm, Mon-Fri.